Hull Trains boss underlines commitment to get back on track. 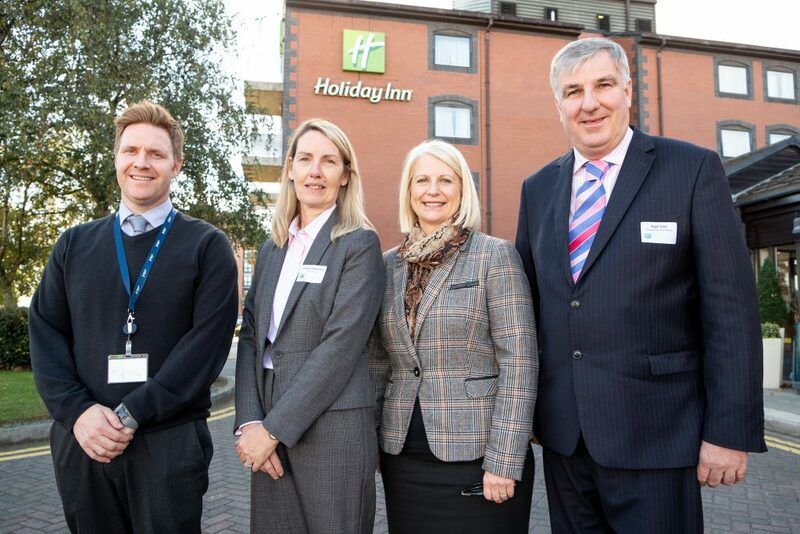 James Leeming of Highways England, Louise Cheeseman of Hull Trains, Kathryn Shillito of HullBID and Nigel Dibb, General Manager of the Holiday Inn Hull Marina. The woman at the top of Hull Trains has demonstrated her dedication and commitment to steer Hull Trains into an exciting new era when she addressed a business audience in Hull. Louise Cheeseman, Managing Director of Hull Trains since February, told city centre business leaders of the company’s commitment to innovation and hard work to overcome the recent challenges faced by the train operating company, as well as the plans for major investment to ensure a successful future. Ms Cheeseman, whose rail career started as a guard with Northern Spirit in Hull, highlighted the problems posed by the “Beast from the East” which hit the rail industry nationwide earlier in the year. She said Hull Trains had bounced back and was performing to the standards which have earned a series of national awards for performance and service. In September the company celebrated its 18th birthday by passing the milestone of 10 million passengers, before unrelated mechanical faults to two of the firm’s four trains started a period of severe service disruption in October. A fault to one of the services on Wednesday, October 3rd reduced the company to three trains, before a minor fire under one of the trains two days later reduced the fleet further. But as an open access operator rather than a franchise, the company is unable to go to the Government for help. Ms Cheeseman said: “It’s lovely that everybody is so interested in Hull Trains but we stand or fall by our own success or failure. We don’t have the government standing behind us ready to take the keys. The forthcoming re-modelling of King’s Cross station will present more challenges for train companies that use the station but the future remains bright for Hull Trains, with five new trains due for delivery late in 2019 a cost of £60 million and with plans to include stops at Hessle and North Ferriby, as well as an additional service to Cottingham and Beverley. Ms Cheeseman urged her audience: “Please support us. It has been a difficult year but it’s one out of 18. We had problems earlier in the year and we sorted them out and we will do it again. Ms Cheeseman also revealed that threats had been made on social media – but not carried out – to disrupt her presentation to members of Hull Business Improvement District (HullBID) who met at the Holiday Inn Hull Marina. She said: “The abuse that we are receiving is not nice for anybody. Our staff read the media and social media and it’s getting beyond a joke now. Even today I had to warn the organisers that people had threatened on social media to come and disrupt the event. “When I was first invited a couple of months ago the business was flying and we were doing really well. The last three weeks have been pretty challenging and my first instinct was to say I haven’t got the time to come because I’m working 90-hour weeks. But this is a great opportunity to right some of the wrongs that are being put out there and give you the insight into some of the challenges that we are having to deal with. The audience also heard from James Leeming, Senior Project Manager of Highways England, who gave an update on plans for the redevelopment of Castle Street, and from Ojay McDonald, CEO of the Association of Town and City Management. Mr Leeming said preparation work has now started for construction of a footbridge over Castle Street and “you will see a lot of movement before Christmas” with some road closures during the evenings from week commencing Monday 5 November to allow safe access for the workers. Mr McDonald spoke about the pace of change facing town and city centres and highlighted the opportunities presented by residential developments. Be the first to comment on "Hull Trains boss underlines commitment to get back on track."